Finding free ink cartridges in Ireland on the web always makes it worth the search. There is a trend in the UK at the moment with multipack offers consisting of at least one free ink cartridge when bought as part of a bundle offer. This trend began almost a year ago with the big web sellers offering free toner and ink when buying a full set of ink for a printer. Many people wondered if it would last but it seems now that most of the large on-line retailers in the UK have taken up this mantra. 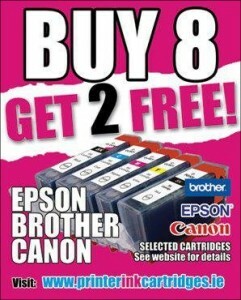 You can now get free toner and ink when you buy all four colours and can then expect to get a free black cartridge. This proves very useful for the heavy user of the black ink particularly for those of us who print out reports on a regular basis. Printerinkcartridges.ie are the first, we believe, in Ireland to offer the free ink cartridges on our website. Here are some of the offers that you can expect to get when you visit our website. This offer on toner and ink cartridges means that you can get a free ink cartridge (usually black) when you order a full set of 4 cartridges, that’s 5 inks in total! This offer on toner and ink cartridges means that you can get 2 free ink cartridges (usually black, although we will let you choose your colours if you wish) when you order a full set of 8 cartridges, that’s 10 inks in total! This offer on ink cartridges means that you can get 3 free ink cartridges (usually black although we will let you choose your colours if you wish) when you order a full set of 12 cartridges, that’s 15 inks in total! This offer doesn’t apply to ink toner as we find that most of our customers don’t want to order in that quantity. This offer is the daddy of all the offers on inkjet cartridges. You can get 4 free ink cartridges (usually black although we will let you choose your colours if you wish) when you order a full set of 16 cartridges, that’s 20 inks in total! This offer doesn’t apply to toner ink as we find that most of our customers don’t want to order in that quantity.